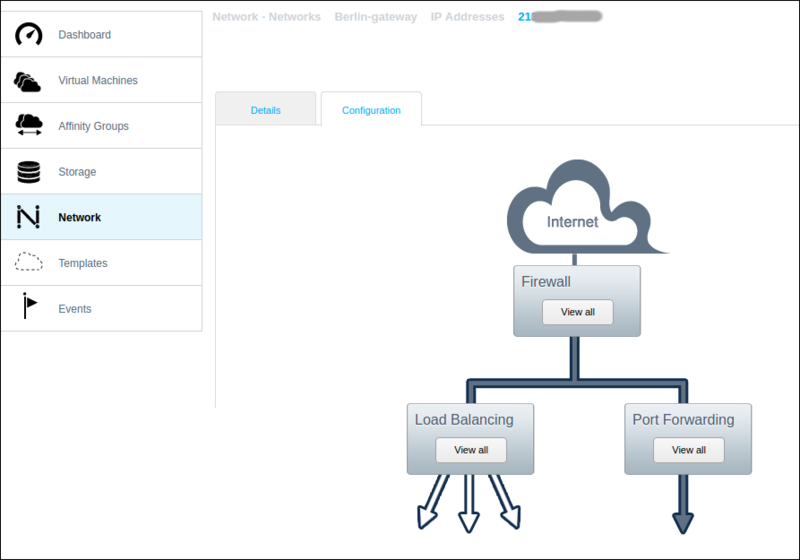 A basic Internet connection to a VM requires you to add a firewall rule, and to set the port forwarding configuration. This procedure is illustrated here for the case of creating a connection for an SSH (secure shell) login to a Linux VM. For the case of a Windows VM, see How to connect to your Windows VM. Take care that a VM has a secure root password, before you activate any Internet connection. For virtual machine templates that use a public default password you will need to reset the password via the VM console. Start Port and End Port: for SSH, both of these are set to 22. Private Port start and end: for SSH, both of these are set to 22. Public Port start and end: for SSH, set these to 22. You will of course need to know the VM root password, which is displayed when the VM is first deployed. On a Windows computer, you can use an SSH application such as the PuTTY telnet/SSH client [www.putty.org] to open a secure shell connection. Virtual machines exposed to the Internet are subject to frequent malicious attacks and this will start to happen within one or two minutes of the VM first being connected. When the SSH login port is exposed, secure passwords are vital, for all user accounts of the VM. There are several ways of increasing the level of security for the VM. It tends to be the case that anything which increases the difficulty of malicious attack also makes it more difficult for legitimate users to access the VM, and therefore security measures can get loosened. However it is important to keep in mind that all VMs on the Internet are subject to malicious attack at all times, not only those which are acting as 'public' servers for websites. Port forwarding rules can be used to improve security by setting the Source CIDR to a restrictive value based on specific public IP addresses or address ranges. For example, you only allow the public IP addresses assigned to the networks at your company premises. In this case, users who are away from the premises will need to have access to some form of proxy service to connect to an authorised public IP address. You can reduce the number of malicious login attempts via SSH by not using the default port 22 but instead setting the firewall Port and Public Port to a non-standard value (so-called 'obscurity by security'): the port numbers 49152 to 65535 are 'dynamic'/'private' ports and can be used for any purposes (see IANA port number registry). The disadvantage of this is that both users and automated services expect the SSH port default and may not be able to use other ports (for example, if a user's computer is behind a restrictive firewall that only exposes port 22 for egress). A better approach to improving SSH access security is to consider disabling SSH password-based access for a VM and requiring the use of SSH 'key pair authentication'. See VDC API: How to use SSH key pairs for setting this up in VDC. In this case the possibility of malicious access by matching key pairs is vanishingly small. Nearly all automated programs based on the SSH protocol make use of key pair authentication as the default. You should also consider whether continuous SSH access via the Internet is needed and use the VDC Control Centre or API to open the firewall only when it is required.